Friedrich Soennecken (September 20, 1848 – July 2, 1919), was an entrepreneur and inventor. He was the founder of Soennecken, a German office supplier. Soennecken was born in Iserlohn-Dröschede, Sauerland in 1848, the son of a blacksmith. On May 27, 1875 he founded the F. Soennecken Verlag, a commercial enterprise in Remscheid, Westphalia. His main invention is the "round writing" style of calligraphy and the pen nib associated with it. 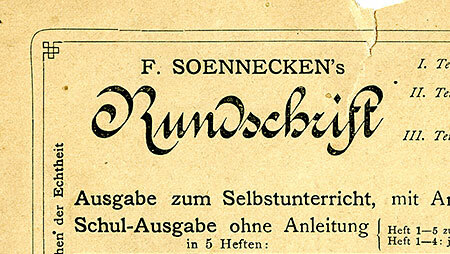 Round writing was designed to be a visually appealing, standardized style of penmanship which was easy to learn and execute, and Soennecken published books on the topic in several languages. In 1888, Friedrich Nietzsche wrote to a friend that he had finally discovered both a quality paper to write on and a quality pen from Germany: Soenneckens Rundschrift Federhalter. Soennecken also introduced the two-hole punch and the ring binder. In 1876 he and his company relocated to Poppelsdorf, near Bonn, to be closer to the University which later awarded him the honorary title Dr. med. h. c..
Soennecken died in Bonn in 1919. ^ Blair, Lawrence E. (1922). Principles and Practice of Show-card Writing. McGraw-Hill. pp. 19–20. Retrieved 2008-12-06. ^ Soennecken, Friedrich (1879). Methodical Text Book to Round Writing. A. Eltzbacher & Co. Retrieved 2008-12-06. This page is based on the Wikipedia article Friedrich Soennecken; it is used under the Creative Commons Attribution-ShareAlike 3.0 Unported License (CC-BY-SA). You may redistribute it, verbatim or modified, providing that you comply with the terms of the CC-BY-SA.